Text messaging allows restaurants and cafés to engage on a personal level with customers at any time. Restaurants are able to target specific groups of consumers with specially tailored deals, providing customers with the best value for money possible, and increasing their loyalty to a particular restaurant or brand at the same time. The compiling and sorting of customer data in the Textlocal system can be used in a number of exciting ways, from sending offers to customers on their birthday, to updating them as to when their favourite seasonal dish is back on the menu; the options are limitless! A key strength of the SMS business service offered by Textlocal is that it is so unobtrusive; customers need only receive offers that are of particular value to them, and they are able to peruse marketing materials as and when they want to. Our SMS service is also fast, cost-effective and highly accountable, all great attributes for any restaurant. And because Textlocal offer more than just a basic 160 character text message, we’re full of ideas of how to stand out from the crowd with feature-rich content to boost profits and keep your customers coming back. Create unique, direct and targeted messages to send to your customers to generate more business. Use our Attachments tool to include PDF’s, words docs, images and Power Point files in a text message at no extra cost, with full reporting on open rates. Invite diners to text your keyword to our short code to receive a unique mobile discount voucher for their next visit. Integrate your CRM or booking system with your Messenger account through some simple API coding to send automatic, tailored and well-timed messages. Mobile vouchers can be created and scanned multiple times, enabling you to reward customer loyalty. Upload mobile numbers directly from your mobile phone to the Messenger App to easily co-ordinate text message campaigns while on the go. Available from the Apple and Android stores. Send a mobile survey to customers after they have dined with you to get fresh and honest feedback about their experience. Using a keyword on a short code, ask customers to text in to join your mailing list to be receive future promotions, mobile vouchers and menu updates. Show off your menus and special offers by including short links to your website in your text messages. Messenger will even report back on who exactly has clicked on your link. 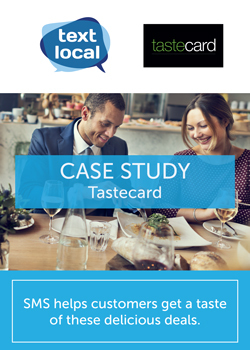 Download the latest restaurant case study from Tastecard.